Two teenage boys who were injured in an assault in a Harrogate park remain in hospital two days after the attack. They were injured in Valley Gardens at 15:30 BST on Saturday. Unconfirmed reports suggested the boys had been stabbed. Image caption North Yorkshire Police said two boys from the Leeds area were released under investigation. 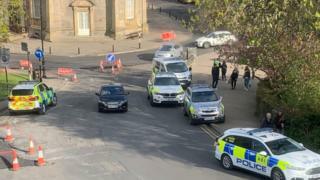 North Yorkshire Police said they were not looking for anyone else in connection with the incident.